Sunglasses are essential - at least wherever the sun shines. But they aren't just for blocking the sun. For many people they are essential fashion accessories. They don't just want practical - they want stylish. But did you know that some of the most popular sunglasses today have been popular for decades? 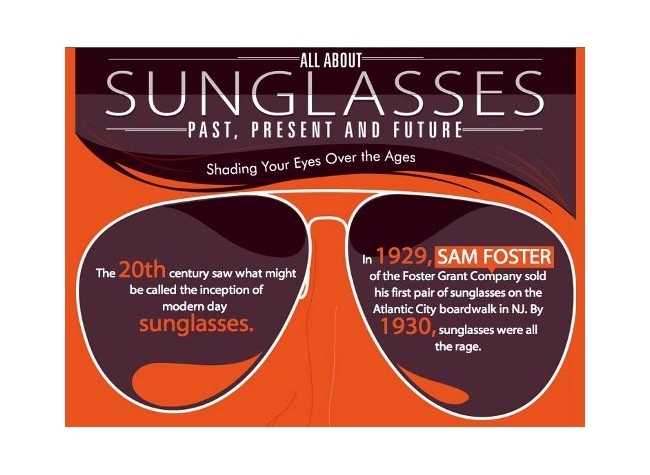 Click on this fun infographic to take a walk through the history of sunglasses to find out if what you think of as "the latest" sunglasses have actually been around for years - or even since the '50s! Popular sunglasses are both styles and brands. Wayfarers, Aviators, Tea Shades, and Jackie O's are all still popular. Think Top Gun for Aviators. Or look at what your favorite celebrity is wearing in 2013. Tea shades are still popular, but they are more commonly known as the sunglasses John Lennon wore than as their own name. If you're into being fashionable, you need to know what sunglasses are "in" this year. The way I find out is by asking the owner of CTSwholesaleSunglasses.com because they have to predict that to know what kind of sunglasses to make. They have a blog where they post photos of celebrities in their favorite shades and publish what sunglasses were hot sellers at the latest event. Whether you just want your sunglasses to protect your eyes from the sun or you want to sport the flashy new neon colors of the latest Wayfarer sunglasses, you can save money by checking out the fun infographic and then popping in to see the hundreds of styles and colors available. If you wish you could afford the top name brands - but have better uses for that money - you're likely to find just what you want. Gail Gardner loves helping small businesses at GrowMap.com and is known in the blogosphere for the GrowMap antispambot plugin (GASP). If you've seen the check box asking if you're human, you've seen that great spam blocking plugin. WordPress shows 74,699 downloads to date so you know it works. You can find her as GrowMap on Twitter, Google Plus, Pinterest, LinkedIn and Skype.